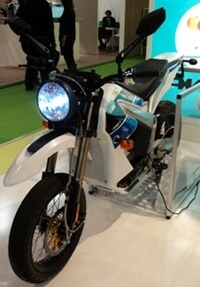 An electric motorbike that can be started with an NFC phone was shown off at last week’s Cartes tradeshow. 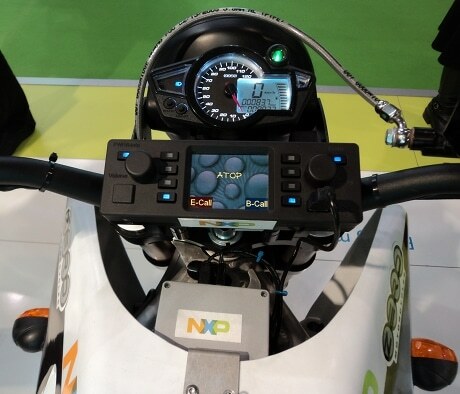 The fully road legal bike incorporates NXP’s ATOP (automotive telematics onboard platform) unit, which also enables the display of diagnostic information on a mobile phone. The all-in-one black box solution can send information to a mobile phone application allowing the owner to check battery levels and other status data. The user can even check the bike’s location remotely via a built-in GPS, and the machine offers customisable and downloadable engine noises — a road safety requirement for silent electric vehicles. Additionally, the unit includes eCall, a European Union safety initiative which on detection of a collision automatically calls the emergency services and sends the machine’s location via the bike’s on-board communications system.